Me-Made-May ’15 and what’s on the hook! Wayhay!!! It’s nearly here! I so enjoyed seeing everyone’s MMM posts last year and now I’m taking part! I won’t go into the nitty gritty, but if you haven’t heard of it (mum….that might be you!) see So, Zo… What do you know?‘s blog to read all about it and see who else has signed up. We’re looking at nearly 500!!! Good luck to all you Me-Made-Mayers out there. Looking forward to reading your posting already. Oh, and something not related, but hopefully it will be finished well before the end of May, I’ve started to Crochet another bag. I made the orange, pink and white one last year after only 4 months of learning to crochet. I’ve just struggled to find the above photo of it and for the life in me really don’t know why I never wrote a post about it. It consists of 20 squares which took about 45 minutes each, then had to fasten together, make the handles and line. A lot of hours, probably near on 30, but I used it so much I want another for this year. These are the colours for this year’s summer bag, and hopefully they’ll go with most casual outfits. I loved this bag!! Great new colour for the Summer! Thanks! I just need some sunshine and a few hours watching the cricket to get it finished! Bet you’re looking forward to your long weekend? Hope you have a good one! No RTW tops at all? Yikes, that sounds hard… Lovely bag! I thought I should challenge myself properly, and as I wear something me made nearly everyday I felt I should make it a bit harder. In for a penny, in for a pound! The bag is one of the loves of my life! It’s why I learnt to crochet – I saw it in a magazine the year before and cut it out for one day when I’d be able to make it. Was so pleased when I finally did! Good luck with your pledge, especially the no RTW tops bit – that’s very brave! I love the colours for your new bag! I’m not sure, but I might be going to the driving range so may be my new golf top!! I was thinking about limiting myself to my RTW jeans only twice a week but that would be too hard when the weather’s cold, I think the no tops will be more do-able…. I hope!! Eeek I’ve just signed up to MMM15 too (what was I thinking???). Love the colours of your new potential bag! Good luck!! It’s exciting it’s it! This one is cotton. The handles stretched out on the last one, but not much and the inside is lined with white/pink polka dot fabric. I’ve made none cotton knitted ones and lined them. On one i made the handle from long thin rectangles and inserted a strip of fabric as I sewed it into a tube shape – that worked really well and didn’t stretch out at all. Yep – livening up def in order! That bag is gorgeous! So impressed you made it after only just learning to crocheting. I’m planning on learning to crochet this month, and even more excited about it now I’ve seen your bag. Where’s the pattern from? I’d love to give it a go. Good luck with me made may! 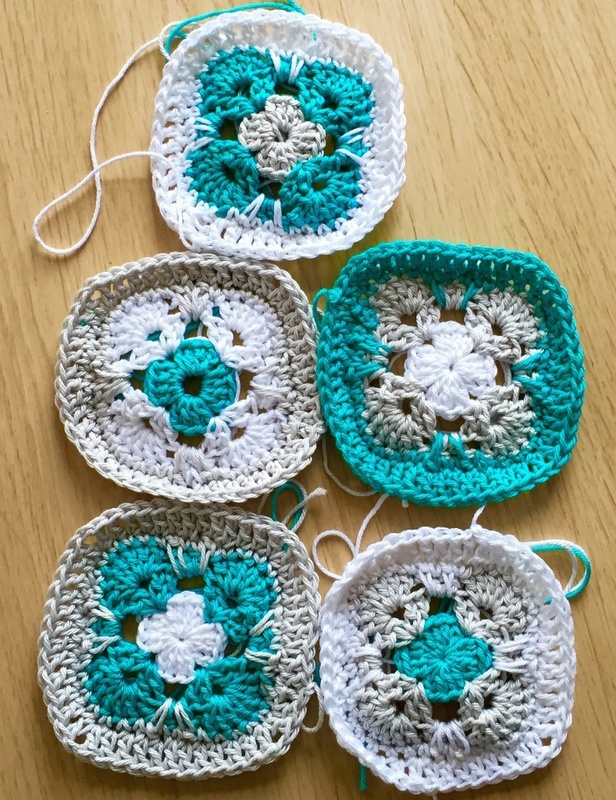 I learnt to crochet initially with a craftsy class, then learnt more stitches from a website called newstitchaday – have a look at their stitchionary. They have loads of individual mini videos for every stitch out there, including how to change colours. My bag pattern is from a magazine but I can let you have it if you want. Email will probably the easiest. Thanks for the tips and for offering to send over the pattern. Very kind. I’ve booked a 2 hour 1-2-1 at a local shop in a couple of weeks time to learn. It was only £15 and I’m sure I’m due a treat. But I will take a look newstitchaday once I’ve got the basics. Have you a contact form on your blog? Not sure best plan is to put email addresses in comments? Of course I’ve two weeks until I start to learn and then I might be rubbish, so shall I contact you when I’m ready? Thanks. And thanks for the email 🙂 I’ll harass you if I get competent enough to need the pattern. Have a great weekend! Being a relative new reader, I didn’t realise you crocheted as well – Snap! Love your bag and the blue colours for your new one. Crochet is my other passion. I love to crochet, mostly I only get chance at work between calls, so I always hope for a quiet shift! That’s a great bag, is it your own pattern? I will probably have to revert to crochet once the sewing machine is packed for the move. The pattern was from a crochet pattern about 2 years ago and it’s what made me want to learn. It’s made up of 20 small squares, I suppose any would work. Don’t think I can ‘reproduce’ the pattern, but I could ‘lend’ you it!